We don’t call it a Lifetime Shower just because it’s built to last: it also adapts as your needs change. 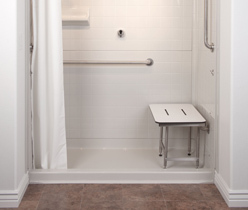 This is because it’s convertible to a barrier free shower, allowing for restricted mobility or wheelchair use. The Lifetime Shower looks like a traditional shower, albeit one made with gel-coated walls and faux-tile finish. This makes it much easier to clean than a standard grouted shower, yet its design looks just as beautiful. What makes it truly innovative is that the shower doors can be removed, along with the semi-permanent threshold to create a bathing area for people with accessibility issues or need assistance. 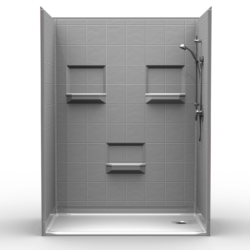 The Lifetime Shower’s semi-permanent threshold is custom-fitted for each design, made of heavy gauge aluminum, and coated to match the unit. They are strong enough to hold a glass shower door. 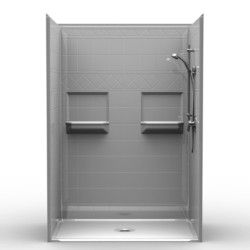 Lifetime Showers are durable, configurable, and backed by our 30-year limited warranty. This is why we say it’s the last shower you will ever need.